Social Ecology of Infectious Diseases explores how human activities enable microbes to disseminate and evolve, thereby creating favorable conditions for the diverse manifestations of communicable diseases. Today, infectious and parasitic diseases cause about one-third of deaths and are the second leading cause of morbidity and mortality. The speed that changes in human behavior can produce epidemics is well illustrated by AIDS, but this is only one of numerous microbial threats whose severity and spread are determined by human behaviors. 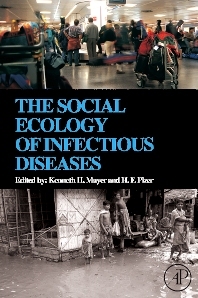 In this book, forty experts in the fields of infectious diseases, the life sciences and public health explore how demography, geography, migration, travel, environmental change, natural disaster, sexual behavior, drug use, food production and distribution, medical technology, training and preparedness, as well as governance, human conflict and social dislocation influence current and likely future epidemics.